We have been doing auto repair for a long time. Over time, we’ve developed a deep understanding and knowledge of the various parts manufacturers, whether we are talking OEM or aftermarket parts. This expertise has allowed us to forge long-lasting relationships with the highest quality parts vendors in the industry to ensure your vehicle is always serviced right the first time. We are so confident in the quality of our parts and our work that we offer to all our customers, starting September 1, 2016, a Limited Lifetime or 36 months/ 36,000 mile warranty on our parts and labor. 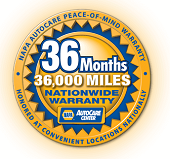 Yes, many other automotive service centers out there will extend you warranties, but we would ask you to shop and compare, as we think we have the best warranty out there. And in the end, this is probably one of the best claims we can make to how much we care about our customers and their vehicles. *If you have your brake pads/ shoes serviced by us, you will then have free lifetime pads, no matter what. We have some conditions, but no gimmicks. Call us from more details. Since 1982, Winkler Automotive Service Center has developed a well-earned and award-winning reputation as one of Maryland’s premier auto service center for its commitment to quality service, reliability, friendliness and honesty. You put your trust in Winkler Automotive Service Center, and we won’t let you down. From your very first visit, you’ll notice the “Winkler Difference.” It’s the attention to detail, the commitment to providing you with accurate and honest servicing, the goal of putting a smile on your face when you drive off . . . that makes the difference. The Limited Lifetime Warranty does not apply to routine schedule maintenance items. The “Warranty Record” is not assignable and is for exclusive benefit of the customer and vehicle identified herein. In the event that an automobile mechanical service rendered by Winkler Automotive Service Center fails to perform satisfactorily within the specified period from the date of invoice, then the same service as covered by original invoice will be rendered to the degree necessary to correct the faulty performance, unless the invoice is noted to show that the customer declined to authorize certain specified labor, parts or materials as required for satisfactory performance. Winkler Automotive Service Center, rendering the original service, will handle such corrections without any additional charge for labor, parts, or materials. Only in cases where new labor, parts, or materials might be authorized, over and above that specified on the original invoice, will there be any additional charges. Should you have any questions or problems concerning this service policy which is not explained or handled to your complete satisfaction by Winkler Automotive Service Center, please write with details to: Winkler Automotive Service Center, 401 E. Diamond Avenue, Gaithersburg, MD 20877. Warranty service within the Winkler Automotive Service Center service area– which includes a 50-mile radius thereof—must be performed at the original repair facility. Please contact Winkler Automotive Service Center at (301) 258-2774.